There’s nothing like sibling harmonies. 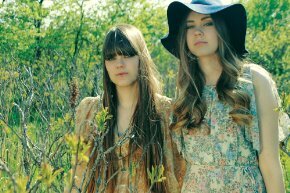 And the bittersweet blend of Sweden’s Söderberg sisters is a typically close-meshed and pleasing sound. What is atypical, for two gals from Sweden, is their choice of style and subject matter. Their sound–steel guitar and atmospherics that bring to mind bands like My Morning Jacket and Fleet Foxes–lands them squarely in Americana territory. And “Emmylou” name-drops country legends like Emmylou Harris, Gram Parsons, Johnny Cash and his wife June. I guess that’s illustrative of the ever smaller and more interconnected present-day music scene. And it would take a more qualified writer than myself to say whether this is brilliant cross-pollination or unfortunate homogenization. Will there come a day when contemporary Scottish music doesn’t sound distinctly Scottish anymore? When you can’t tell that an African rhythm is really African? Has that day already come and gone? Is something lost when it all gets mixed together? Or is this kind of musical melting pot the way to stir diverse influences into brilliant music we’d otherwise never know? I suspect both are true at the same time. It’s great that American musicians are making “World Music” and Swedes can do Americana and, hey, where would we be if British bands like Led Zeppelin and the Rolling Stones hadn’t chosen threads of American blues and R&B to weave their rock tapestries? But perhaps what’s inevitably disappearing as the music world shrinks is the same thing we notice disappearing when we travel to eastern Europe and see McDonald’s and Subway and Pizza Hut crowding out the small, long-established locals. Maybe we’re losing a little of the provincial flavor. The only thing I know for sure is that if these two girls want to sing like they’re from Kentucky, I’m all ears.